The bed gives support to all the mountings of the lathe. It may be casting of Nickel alloy cast iron and is carefully seasoned, machined and scrapped. Seasoning of bed is done to avoid distortion due to cooling stresses developed during solidification of the bed after casting. (b) Increasing hardness of the wearing surface by flame hardening. (c) Superimposing separately hardened steel slide ways over the top of the bed casting. It is a moving part and can be fixed at any desired position on the bed. Its body is made of cast iron. It is made in two halves. The lower half (base) is fixed on the bed and the upper half is fitted on the base. The base can move along the bed ways. The upper half can be adjusted sideways on both sides, while offsetting the centre for taper turning between the centres. Adjusting screws are used for adjusting the tailstock for offsetting. One screw is loosened while the other screw is tightened for setting the tailstock centre to one side. The main shaft of the headstock is called spindle. It is a hollow shaft. The front end of the spindle is called the nose and it carries a dog plate or a chuck to hold the job. Cone pulley or gears are used to change the speed of spindle. Back gear is used to transmit the heavy power with reduced speed. It is a hollow cylindrical shaft and revolves in two bearings, fixed one each at the front and rear ends of the head stock. Long metal rod can pass through to other side of the head stock. The spindle end facing tail stock is called spindle nose. Spindle nose has Morse taper to accommodate the lathe centre or collet chuck. It has threaded portion to accommodate face plate or chuck. (a) Saddle. It is part of carriage which slides along the bed ways and supports the cross slide, compound rest and tool post. (c) Compound Rest. It is mounted on the cross slide. It has a graduated circular base, which is called swivel plate. Upper sliding part moves parallel to the bed and the lower part can be swiveled to the desired angle. It is used for turning tapers, conical shapes etc. (i) Round Tool Post. It has a cylindrical body with a slot into, which the tool is inserted as shown in figure. The bolt tightens the tool. This tool post is generally used for light work because the tool is not held with sufficient rigidity. (ii) Open Side Tool Post. In this tool post the tool may be clamped more rigidly. In this tool post the height of the cutting edge can be adjusted by means of rocker. The tool is clamped by two strong bolts. (iii) Square Tool Post. It is also known as square turret or four way tool post. It can accommodate four tools, which can work one after the other by rotating the tool post. It saves time of removing and setting the tools. (iv) Quick Change Tool Post. The quick change tool post is mounted on the top slide, and the tool holders can be clamped within seconds by turning the lever. This works on an eccentric locking device giving high rigidity to the tool holder. The tool height can be adjusted by loosening the square head screw, the tool post can be moved up or down as per the requirement. Once the height is adjusted, it can be retightened the screw. (e) Apron. It is a rectangular box, which is suspended towards lead screw below the saddle. It has a gear train inside and a half nut. The half nut lever is located outside. All feed levers and feed clutch also housed in it. In short we can say that the apron contains the mechanism of controlling tool feeds and thread cutting. The feed shaft is a long and accurately finished shaft supported at both ends in the bearing situated at either end of the lathe bed. This is also passing through the apron parallel to the lead screw. It is provided to effect the automatic movement to the saddle and cross slide. It gets the drive from the machine spindle through a feed box. It has got a long keyway running the entire length of the rod which carries a gear in the apron. This gear rotates when the feed shaft is given power and transmits the motion to another gear in mesh with it and having worm shaft integral. By operating a lever on the apron the worm gets engaged with a worm gear which in turn drives another gear. This gear is in mesh with a rack provided on the side of the lathe bed and when in operation, the rotating gear travels along the rack and carriage. Tumbler gears are used to change the direction of rotation of the lead screw and the feed shaft. The saddle and the cross slide can be given automatic movement to the desired side. The mechanism is an assemble of gears i.e. two gears incorporating the tumbler mechanism and the third one the stud gears assemble on the quadrant plate. The back gears are used for effecting reduction in spindle speeds, thereby facilitating a wider range of speeds. The back gears are mounted on an eccentric shaft which is operated by means of a hand lever known as back gear engaging lever. The back gear is disengaged by shifting lever. When bull gear pin is engaged the cone pulley gear, bull gear and the spindle will rotate as one body. For reducing the spindle speed by back gears, take out pin to disengage the bull gear from cone pulley engage back gear with the gear through lever. This way when cone pulley will rotate the gear will rotate and this will rotate back gear. This is mostly used while cutting the threads. The feed or quick-change gear box serves the purpose for changing the speeds of feed rod and lead screw. By changing the speed of feed rod and lead screw the change in the automatic feed can be achieved. To extend the cutting process over the entire surface of the work piece, the tool may be moved with varying speeds in relation to the revolution of the work. The feed movement to the cutting tool is imparted either by hand or power on lathes, which do not have a feed gear box, feeds are obtained by changing the gears. This method involves lot of time and is inconvenient also. 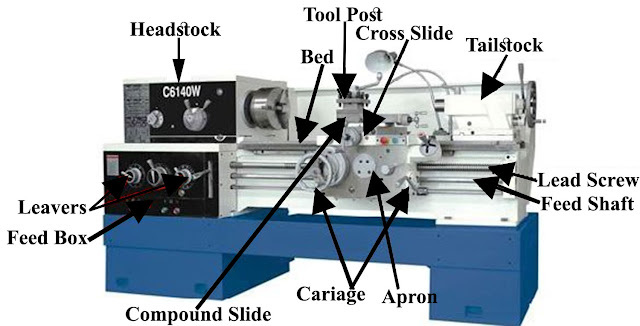 The feed of the tool along the axis of the lathe spindle is called longitudinal feed and that perpendicular to spindles axis is called cross feed. The feed of tool influences the surface finish on the work. A coarse feed results in poor finish and vice-versa.